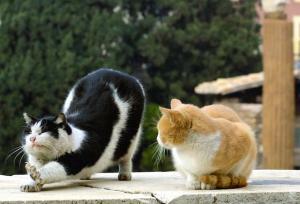 TWO CATS SUNBATHE AROUND THE ROMAN TEMPLES OF TORRE ARGENTINA IN ROME - Sognare Roma - Мечтать о Риме! Two cats sunbathe over the Roman temples of Torre Argentina in Rome, December 20, 2001. Thousands of cats who have made their home in the nooks and crannies of Rome’s famed columns are now as protected as their surroundings after Rome’s council has nominated the 150 cats as a part of the city’s historical heritage.